Originally known as ?TNT MIX?, Anibal ?Tito? 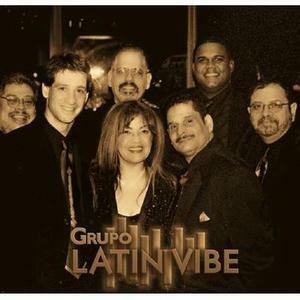 Rivera and Tommy Mattioli embarked on a musical journey, when they met in the 90's, later reducing the band to 7 pieces now known as Grupo Latin Vibe. ANIBAL TITO RIVERA - Composer / Arranger, congero, and lead vocalist Self-taught in the art of playing guitar / Cuatro and congas, born in Brooklyn, NY de sangre Boricua blessed with the ability to spontaneously create swinging melodies, and lyrics at an early age. ANIBAL TITO RIVERA - Composer / Arranger, congero, and lead vocalist Self-taught in the art of playing guitar / Cuatro and congas, born in Brooklyn, NY de sangre Boricua blessed with the ability to spontaneously create swinging melodies, and lyrics at an early age. He worked with several local bands including the Xavier Cugat Orchestra y Pipo y La Superior, but for creative differences, decided to focus on his musical calling. After attending a refresher course on music theory at Boys Harbor Tito joined forces with Tom and recruited a group of excellent musicians and creating the unique sound of Grupo Latin Vibe. TOMMY MATTIOLI Vibraphonist and Composer/Arranger from Rochester, NY, raised in Madison, Wisconsin where he attended the University of Wisconsin, and earned a B.A. in percussion with an emphasis in jazz vibraphone. Relocating to Brooklyn, in 1992, he went on to study timbales and piano at Boys Harbor, strongly influenced by legendary artists, such as, Tito Puente, Eddie Palmieri, Cal Tjader, La Sonora Poncena, and many jazz greats, including T. Monk. Tommy developed a taste for arranging classic tunes, which has earned him the respect and admiration of countless musicians. AWILDA MERCEDES SANTIAGO Vocals / Hand Percusion Fronting the group with her electri- fying stage presence, Awilda is the spiritual ambiance of Grupo Latin Vibe. Coached in the art of singing by soul-mate, Anibal Tito Rivera, she has been a loyal friend to fellow band members and all those who surround her, Awilda never fails to WOW the audience into a frenzy with her uplifting personality and charisma. Without a doubt, Awilda has proven to be an insatiable, dynamic entertainer. Dedicated member of the band since its inception and affectionately loved by all. CARLOS VELAZQUEZ Bass Has performed with The Joe Papp and The Familia Marvin Pancho Camillo theater groups . The Henry street settlement Symphony orchestra and legendary artists: From New York- Hector Lavoe, Jose Fajardo y Sus Estrellas, Adalberto Santiago, Pete Conde Rodriguez, Ismael Quintana, Jonny Pacheco . From Puerto Rico- Rafael Cortijo, El Sonero Mayor Ismael Rivera, Daniel Santos, Frankie Ruiz, Paquito Guzman, Iris Chacon and Luigi Texidor y La Sonora Poncena Del Ayel. From Santo Domingo- El Duende, Nunes y Sus Meregeros , Raulin Rosendo and El Siegito De Nagua. From Colombia- Jerry Galante, Diego Gale, Eddie Martinez and other artists of the Caribbean, South America and Europe. WILLIAM PAUL RODRIGUEZ Piano / Vocals has worked with numerous bands including the David Cedeno Orchestra, was also featured along side Oscar Hernandez in the off-broadway musical show La Lupe. GIANCARLO ANDERSON Bongo Panamanian percussionist with the ability to perform various instruments in varied styles and genres. He has performed with great salsa singers such as Gabino Pampini, Cano Estremera, Eddie Santiago, Maelo Ruiz, among others; and renowned trumpet player Victor Vitin Paz. His New York musical experience includes the Off-Broadway show Godspell, Leehman College Latin Jazz Band and local salsa bands. He studies at Boys Harbor Conservatory where he has had the opportunity to perform in its Big Band. VICTOR RENDON Timbales / Drums Has worked with legends: The Xavier Cugat Orchestra, Chico OFarrill, Mongo Santamaria, Carlos PATATO Valdes, Ray Santos, other great recording artists and co-leader of The Latin Jazz Orchestra.